Customized: Ductless Fume Hood with "Lazy Susan" - Sentry Air Systems, Inc. This particular customer wanted a rotating tray, or “Lazy Susan”, within their Ductless Fume Hood to accommodate and easily access various parts for cleaning [this cleaning process releases particulate, which is quickly sucked up by the Fume Hood’s powerful fan and delivered into the filtration system]. They also specified that they wanted a 40″ Wide Hood. In order to meet the “Lazy Susan” size requirements requested by the customer, the depth of the 40″ Ductless Fume Hood had to be expanded. 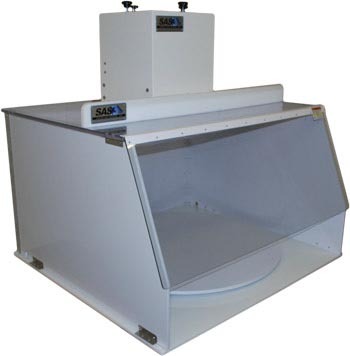 Our standard 40″ Ductless Fume Hood has an interior depth of 23.5″. The depth of this hood was expanded to 38″ to accommodate the 34″ diameter “Lazy Susan”. Overall interior dimensions are 40″W x 38″D x 24″H. The filtration system on this unit is composed of a MERV 8 pre-filter and a high-quality HEPA filter [up to 99.97% efficient on particles 0.3 microns or larger]. Other options are available depending on the application and include Activated Carbon Filtration, ASHRAE and ULPA filters, and specialty-blended filter media for applications involving acid gas, ammonia, aldehydes, and mercury. For more information on this custom modification or other possible options, call Sentry Air at 1.800.799.4609, email us at sales@sentryair.com, or fill out this form to receive more information. Also, take a look at the Custom Hood pageon our company website to see other examples of custom designs.